Unexpected find: Double-decker transit buses and an OC Transpo fanboy site? So this post was going to be all about the shiny new OC Transpo double-decker buses and how it's kinda kewl but sorta scary considering you know, it's Ottawa and we have snow and sleet and black ice and stupid drivers and I can just picture one of those tipping over into a snowbank. But then, something totally threw me for a loop. In my search for a photo of said shiny happy double decker buses, I found a site. A site that, frankly, surprised me. A site called: "OC Transpo Enthusiast page". Enthusiast. Really? Wow. The site bears the following message on its homepage: "Welcome to OC Transpo Enthusiast Page. 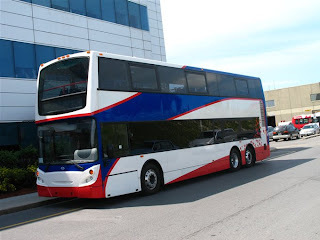 This web site is dedicated to all bus and transit enthusiasts." Now this isn't about the green side of transit, but about being a fan of transit in general. It's got tech specs and photos of the different bus types, photos of buses in ad wraps, even a section dedicated to the types of signage on the front of buses (to denote the route name and number). Who knew?? ?